Tiny 128×64 is a OLED Display based on SSD1306 Display controller chip. The display is mounted on an easy to solder PCB. 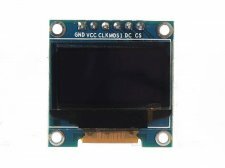 The SSD1306 Display interfaces to microcontrollers through a I2C/SPI interface. Supports various microcontrollers: Fully compatible with Raspberry Pi, Arduino, 51 Series, MSP430 Series, STM32 / 2, CSR IC, etc.